This call button is meant one component of the Emergency Call Light Kit. You should only order this by itself if you are replacing a unit you already have, or extending a unit with more pull cords. If your current unit has the sku 2017-CB, or starts with NCS, choose the new model. If the code on the back of your pull cord starts with 2007-CB, then choose the old style at purchase. If you have questions about compatibility, give us a call! The 2007-CB Bathroom Emergency Pull Cord is reachable from the toilet or floor when mounted on the wall. 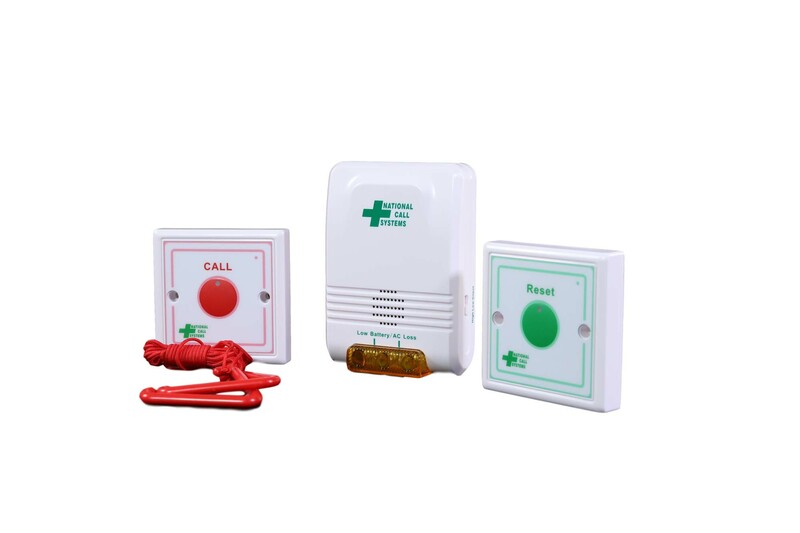 This system is meant to work with the 2007-RB can be programmed to the 2007-ECA Emergency Call light and alarm or to the TL-2015 EliteCare+ Central Monitoring Unit. This system allows residents to have privacy while using the restroom. Also needs reset button (2007-RB), blue in picture, to be placed in the bathroom as well. Waterproof - Can be mounted within bathrooms, showers, steam rooms, as well as near jacuzzi and pools. Easy Install - Quick install with the two screws provided! Pull or Push for assistance - If a resident or loved one is need of help, they can pull the cord or push the button.